Now Stream P90X, Insanity, and Much More! Now AVAILABLE! You can workout while you travel, at the gym, or at home! The NEW On Demand Streaming videos are available for some of the hottest workout programs on the market! 24/7 Streaming access to hundreds of workouts, including the chance to tap into Beachbody’s most popular programs, like P90X®, INSANITY®, and 10-Minute Trainer®, from anywhere you have an Internet connection. Take your Beachbody On Demand workouts with you anywhere you go and push play anytime you like. Want to get in on the hottest workout streaming for about $2.99 a week? Click on the "Lets Talk" Button or leave us a recorded message on the "Send Voicemail" button to get in touch with you. Sign up for On Demand Club Membership Here! Talk to You Soon! Labels: Beachbody-On-Demand , What's New! Get ready to MAX OUT for MAX RESULTS! 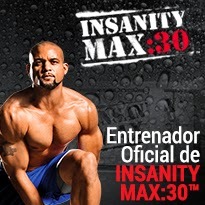 With INSANITY MAX:30, the only thing standing between you and the best body of your life…is YOU. There’s no equipment needed in these killer cardio and strength workouts. Just push to your MAX and get insane results in 30 minutes a day.